If, like myself, you’re not reduced to a headless chicken at the thought of Nando’s or Rooster’s, and you abhor the very mention of bowel-destroying chicken-shops such as Spice Hut, Mile End may prove to be a bit of a barren destination for food. Indeed, for the self-righteous food snob, there’s very little in the way of reputable eateries in the immediate vicinity of Mile End station – save perhaps for Ariana – and it’s a problem that usually forces one to venture forth into Stepney Green or Whitechapel. Thus, when I first caught sight of a burger and steak-based restaurant called “The Greedy Cow”, I couldn’t help but be intrigued. Could this be the dash of excitement that I’d been looking for in Mile End? A real restaurant that wouldn’t disguise Perry the Pigeon as peri-peri chicken? A restaurant whose food wouldn’t confine customers to their bathrooms – attached to an intravenous drip of dioralyte? Eager to see whether two greedy cows could see eye to eye, I promptly headed over to see what they had to offer. Note: Only the chicken and the lamb dishes are halal. Alcohol and pork is served on the premises, and caution must be taken with a few other items – i.e the onion rings, which are made using beer batter. Please check with staff-members when ordering. I first visited The Greedy Cow in early November for a post-workout meal with Blue Eyes and President Clinton, as part of our ongoing, inane belief that an hour of strength training somehow justifies two hours of binge-eating. President Clinton and I began proceedings with a portion of chicken wings, which were soft, succulent, and well-cooked, with a thin, crispy skin and a mildly spicy flavour. I also ordered a cookies and cream milkshake – which proved to be an overly hopeful move – as it possessed an extremely thin consistency, very little ice cream, and had about as much as flavour as a pint of semi-skimmed milk. Luckily, my main course of lamb chops and sweet potato fries proved to be more fruitful. The lamb chops were of a high quality and arrived with a perfect medium cook, resulting in an extremely tender and succulent texture, from which its inherent juices oozed out. Working in tandem with a plentiful amount of seasoning and soy-sauce marinade, these juices delivered a generous amount of flavour to the palate, whilst the accompanying mushroom salad added a strong complimentary tang. 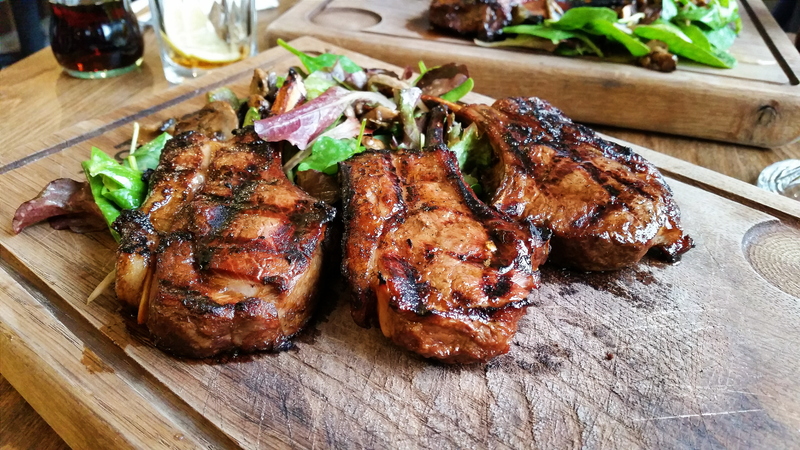 Equally appetising was the fat attached to the chops, which had a soft and delicate texture that literally melted in the mouth. Proportionally to the meat however, two of the three pieces of chop possessed far too much fat. That said, the chops could say the same of me, so I’m willing to turn a blind eye on this occasion. 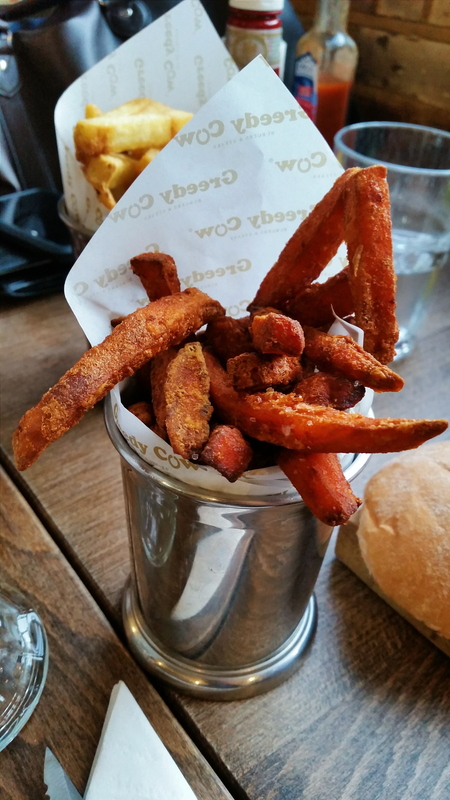 The accompanying sweet potato fries were also of a high quality, with a crispy and crunchy outer layer that contrasted well with the thick potato within, delivering a rich, caramelised-flavour that was layered and full of depth. Based on this positive first experience, I decided to take We Are Bartans to Greedy Cow for a post-results-day meal in May. Little did I know, that I was about to be sorely disappointed. 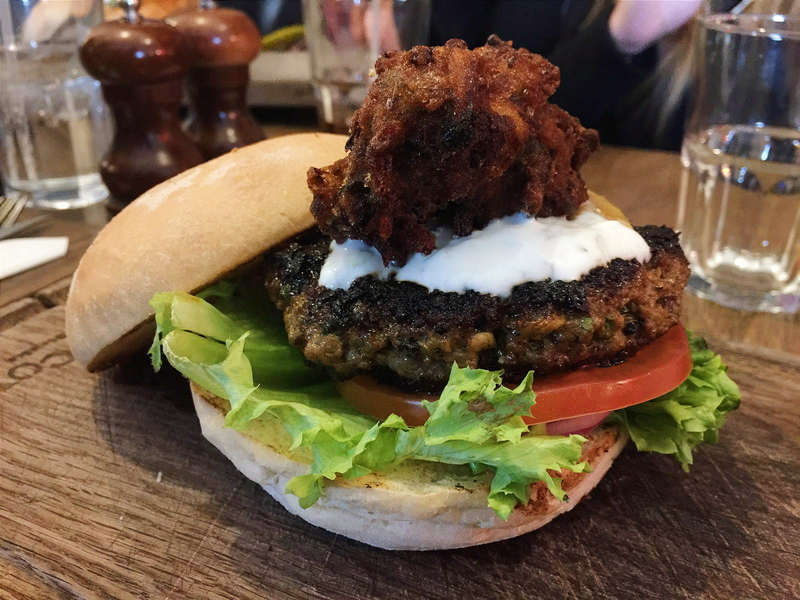 On this occasion, I opted for an Indian lamb burger, which claimed to utilise a “soft sourdough bun” and the “freshest and finest ingredients”. Whilst I would speculate that they were perhaps referring to “Tesco’s finest”, this would be a grave injustice to the Tesco brand, given that the burger was held within a pair of excruciatingly low quality buns. Whether they were taken straight off a supermarket shelf or not, I cannot say, but I can say that they were so dry, stodgy, and dull, that I decided to abandon them altogether and eat the contents of my burger alone. Thankfully, the lamb patty was of a far better quality and had been cooked to medium. As a result, it retained a deep flavour and possessed a soft, moist, and tender texture, which contrasted well with the crunchy onion pakora that sat on top. The patty was also topped with a dollop of mango chutney and raita. However, neither of these components provided a significant contribution, and as a whole, it was a very average burger that fell a significant step behind the tasty lamb chops that I had enjoyed before. Similar feelings were expressed around the table, with Fishwonger and Ulcer describing their chicken burgers as being “plain and tasteless”, whilst Grumpy Dwarf and Paanwala found their own Indian lamb burgers to be enjoyable, but underwhelming nonetheless. The lamb chops I ordered on my first visit cost a rather hefty £17.50, whilst the chicken wings cost £5.50, and the sweet potato fries and milkshake cost £3.50 and £4.00 respectively. Meanwhile, the Indian lamb burger cost £8.80. Generally, mains range from £15-£17, desserts and milkshakes cost around £4 to £5, and burgers cost between £7-£8 without sides, which can be purchased separately for around £3 to £4. For a low-key eatery in Mile End, The Greedy Cow certainly punches above its weight when it comes to the bill. Truthfully, the lamb chops were the only item that I truly enjoyed, and even they left me questioning what I had really paid for. 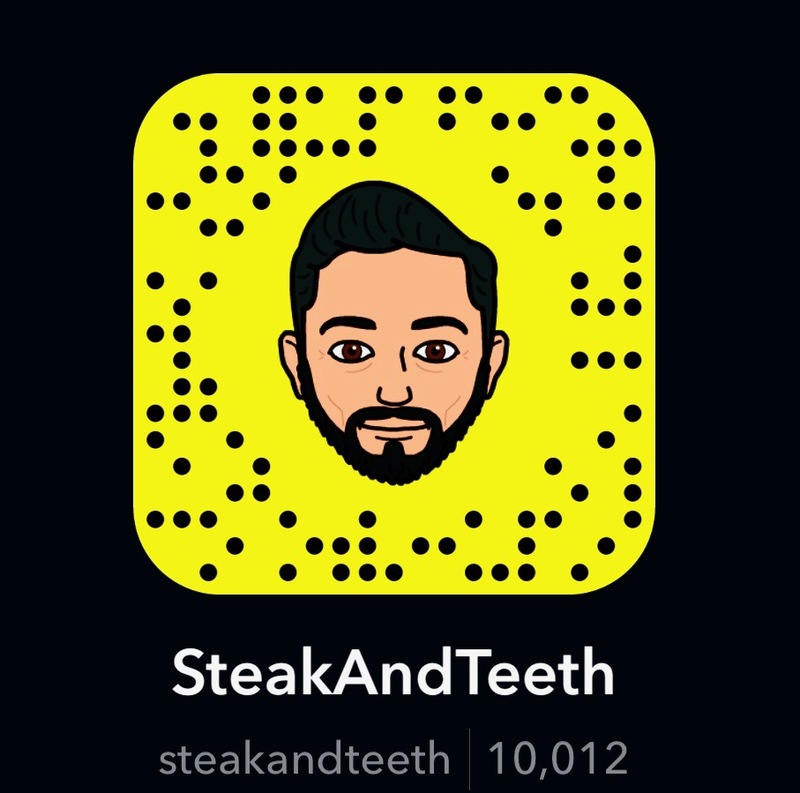 Coupled with the fact that the burgers seemed to be overwhelmingly mediocre across the board, and there’s very little incentive for me to recommend spending your money here at all. Comparatively, the food still fared better than the uninspiring level of service that we received. In a world where dentists are often regarded as being cold and remorseless, our waitress would have done far better to have fulfilled that stereotype than anyone on our table. Whilst she took our orders and served our food rather promptly, she did so in a rather rude and uncaring manner – as though we were somehow an inconvenience to her job, as opposed to being an integral part of it. Perhaps it was down to a case of mid-week blues or the terrible weather that day, but needless to say, we were not impressed by the lack of courtesy. The Greedy Cow employs a simple and rustic decor that perhaps looks a little more tired than it should. Wooden tables, chairs and brown leather seats sit upon a rather worn wooden floor, whilst a large cow hide – (presumably belonging to the eponymous greedy cow that is greedy no more) – adorns the wall nearest to the entrance. There isn’t a great deal to admire, but the setting is comfortable enough for a casual meal. The restaurant is a quick five minute walk away from Mile End station, and parking spaces may be available on nearby residential roads. Despite the unfriendly service, Greedy Cow manages to provide a laid-back environment that is welcoming in its own right. As a result, it’s easy enough to enjoy a relaxing catch-up with friends or family, and there’s no sense of urgency to leave. Much like I did with my father, Greedy Cow shattered my high hopes and proved to be yet another disappointment of the East End. Whilst certain items exceeded my expectations, others fell woefully short, and as a whole, the menu simply could not justify its prices. 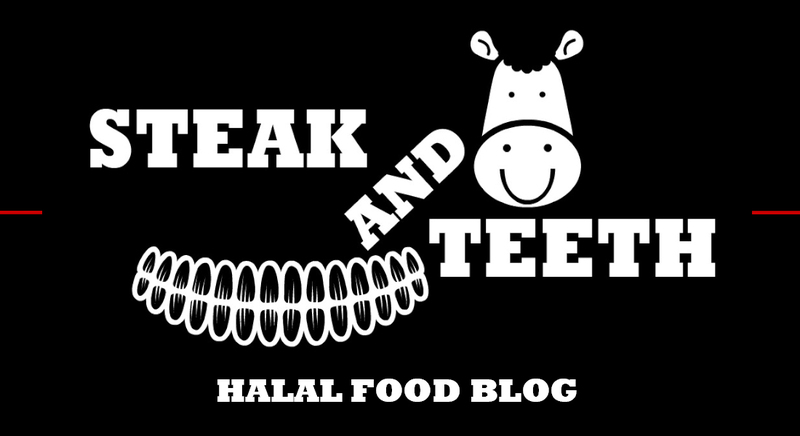 For patrons who do not require halal meat, The Greedy Cow’s range of steaks, beef burgers, and “exotic meat” burgers may provide a more appetising experience, but for Muslims, the available options are a little too uninspiring to justify paying them a visit. Sadly, it would seem that Mile End shall remain a blank and boring blip on my food map, and I can only hope that in the near future, a valiant new eatery will pop up and save the local populace from the cholesterol-ridden clutches of the “chicken-shop mile”.